Home » Everest » Everest 2019 Coverage » Does Ecuador Replace Nepal for Best 20,000-foot Climbs? Does Ecuador Replace Nepal for Best 20,000-foot Climbs? I just returned from a rewarding trip to Ecuador to climb three of their volcanoes. I went with US-based, Mountain Madness. While this was my seventh trip to South America, it was my first to Ecuador and now I see what I’ve been missing! I’ve been climbing and going to Nepal 13 times since 1997. As anyone who has read my blogs knows, Nepal is close to my heart for many reasons. However, Ecuador was so impressive, Nepal may have to share the top spot. In evaluating the two countries for trekking and climbing, both have pros and cons and in this post, I want to explore them. However, before I get accused of being enamored by the new shiny penny, let me add that I felt the same way about Nepal after my first visit and still do. Ecuador makes visiting easy, at least for Americans. I spent less than 4 minutes going through customs – no visa, no paperwork, no fees whereas in Nepal it continues to be a jumble of desks, fees, and paperwork where I plan on 30 minutes to an hour, standing in long hot lines just to pay to enter the country. Verdict: Ecuador by far. Climbing permits are another area that Ecuador takes with no competition. Nepal charges for almost any activity in their country as a means of revenue. After all, tourism is one of their largest revenue sources but on my last visit in October 2018, I noticed more and more fees as I trekked the Khumbu. Ecuador, with their rich oil reserves, only charge guides a small fee ~$100 annually for access to all parks and no fee to their guests. Finally, Ecuador uses the US dollar as their currency, so no money exchange at banks or on the street for those with dollars. The prices felt fair to me and in fact a bargain for most items. Nepal’s Rupee swings in value and requires an extra yak to carry enough of the paper to fund a trek to EBC. When I first went to Nepal in 1997, everything was 100 rupees, now it’s 1,000 rupees. Ecuador certainly has had its share of political problems over the decades, as has Nepal but both are improving in this area with Ecuador well ahead. Today they have a stable democratically elected government. Nepal continues to have wild swings in ideology, inconsistent policies and corruption. Even after the parliament declared in 2007 that Nepal was a federal republic, the government remains in flux with the head of ministries often being political appointees thus creating serious inconsistencies in government policies as each new minister seems to ignore the previous minister’s decisions. In comparison, the climbing policies feel consistent in Ecuador, perhaps due to few rules. However, there is a lot of criticism that climbing above 5,000-meters requires a guide. But Nepal’s mountaineering and trekking policies are like a magic eight-ball. Spin it to see what today’s rules are. Just to mention a few of the popular climbs around 20,000-feet/6,000-meters, Nepal calls these “trekking peaks” and include: Island Peak (Imja Tse), Mera, Lobuche East. In Ecuador the most poplar volcanoes at this elevation include Chimborazo, Cotopaxi and Cayambe. Of course, I would be remiss not mention that some of these are active volcanoes and can be closed to climbing for safety reason as Cotopaxi was for two years and reopened in late 2017. The biggest mountain wins! By that measure Nepal has Everest and Ecuador has Chimborazo. Setting aside the argument of which one pokes into the atmosphere higher, both countries are blessed with geography. Nepal has eight of the fourteen 8000-meter peaks and Ecuador has 27 volcanoes on the mainland and another 7 on the Galapagos Islands. If you want an 8000-meter peak, Nepal wins, and also for 6,000-meter peaks with 297 but not all are open for climbing. But for an aspiring climber seeking to test themselves on snow, ice, steep slopes at 20,000-feet/6,000-meters Ecuador offers a lot. The climbing is convenient, accessible and affordable. You can sleep in a comfortable hacienda or Refugio, leave at midnight and be back sipping coffee by mid-morning with a solid summit. In Nepal, you might be able to stay at a teahouse but most likely will leave and return to a tent. In addition to the permit fees Nepal charges (which require the use of a middle man agency with fee), you need to fly (or walk for days) to reach Lukla then trek more plus pay a trash deposit (I had to put down $500 for my Island Peak climb of just Kami and myself) and hire a guide – a lot of red-tape that Ecuador doesn’t require. All this said, for me, trekking in Nepal is half of the enjoyment and as I always say, “it will change your life.” So not all bad, just not as convenient as Ecuador if climbing is your primary goal. Ecuador, being on the equator sandwiched between the Pacific ocean and the Amazon Rain Forest does have a bit of variable weather that can close in unexpectedly. On Cayambe, we got hit with hoarfrost or rime ice about halfway up making us human popsicles and ending the climb that day. As for rescues, Ecuador doesn’t have the fleet of “for-hire” rescue helicopters that Nepal does nor does it have the current scam of guides putting drops into trekker’s water to make them sick and then skimming off the proceeds from evacuation companies along with the chopper company and hospitals. All of this is acting as a pox on any credibility the Nepal tourism industry has and should be warning for anyone going to Nepal that there are alternatives – especially when or if evacuation/insurance companies stop covering Nepal travel. Well, first off, who is a guide? Someone with 200 summits or a person with an IFMGA/UIAGM certification? Both countries have a lot of both types. In my over 20 years of going to Nepal, I have seen a significant change in guiding. The old school Sherpas, like Kami, are being replaced with young Sherpas who are investing in their climbing knowledge and gaining through qualifications. Many of them are using this knowledge to pursue their own ambitions and setting new marks around the world with speed climbs, back to back to back 8000er summits and more. They no longer look to define their ambitions through guiding foreigners but rather on their own merits and are succeeding admirably. That said, there is now a severe shortage of qualified Sherpas to support the exploding Everest guiding business, so be aware when selecting your operator. In Ecuador, I saw the benefits of similar guides with certifications as well as their own personal ambitions along with an outstanding commitment to their client’s safety and success. For me, I see both countries making outstanding advances in offering quality guide services to their guests and encourage more investment by foreign operators to fuel this process and stop sending their own leadership when the locals are just as competent or better as it just raises the costs for everyone. After my first trip to Nepal, I said: “A trek in Nepal will change for life.” I still feel that way in spite of all the issues Nepal has had over the years. The inviting countenance, smiling faces and genuine openness of the Sherpa and Nepal people are what makes Nepal, Nepal. And I felt the same in Ecuador. I felt safe and welcomed anywhere we went. The smiles came easily as did a helping hand. Nepal has a troubled history sandwiched between the giants of China and India – both maneuvering to control this proud country. Ecuador has its own border issues with Colombia and historically Peru. Both Nepal and Ecuador have it under control for now but it has created islands amongst giants. Nepal’s culture goes back to the 6th century around the Kathmandu valley. Though successive dynasties and monarchies, today’s Nepal purport to be based on democracy however many have other views. 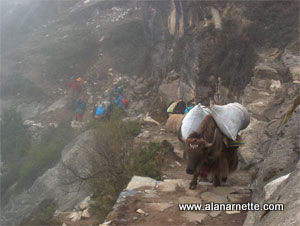 The Sherpa people make up less the 0.5% of Nepalis over 30 million inhabitants and live mostly on the border with Tibet. Prince Siddhartha Gautama, born c. 563 B.C., achieved enlightenment as Buddha and spawned Buddhism. Today, Hindu is practiced by 81% of the population and Buddhism by 9%. The average per capita income in all of Nepal is a bit over $1,000 and $2,500 in GDP per capita. The indigenous tribes of the northern highlands of Ecuador formed the Kingdom of Quito around 1000 before they were taken over by the Inca’s and then the Spanish. In the early 1800s, Ecuador joined Venezuela, Colombia, and Panama in a confederacy known as Greater Colombia but became independent in 1803 when Greater Columbia collapsed. Ecuador has been at war with Peru in 1941 and again in 1981 and 1995 but a peace treaty was signed in 1998. The population of Ecuador is about 16 million people with the primary religion being Catholicism at 74%. The average monthly income is US$447 and $11,000 in GDP per capita showing the income gap that haunts Ecuador. Both countries proudly display their history with monasteries and temples throughout Nepal and extensive Spanish architecture in Ecuador along with the proud presence of the indigenous people and their unique clothing. Ecuador makes it easy and affordable to reach the summit of a 20,000-foot glaciated volcano. Nepal offers higher peaks but with more red tape, costs and inconvenience. Both countries are filled with welcoming people and guides that will take care of you. Both offer stunning scenery that will easily fill your camera’s memory as well as your own. If you are new to climbing and want to see how you do at moderate altitude, Ecuador wins hands down. If you are seeking to test yourself on an 8,000-meter peak you have only three choices: Nepal, China or Pakistan and in this case, Nepal continues to be easiest in spite of all the issues. And not be left out there are fun climbs in Peru, as I found on Alpamayo in 2012 in the impressive Cordillera Blanca, of course in Alaska, Northern India, China, Pakistan, Argentina, Bolivia, Chile, and Eastern Europe but those are for another blog. So no matter where you go, no matter if you want to go independent or top-shelf, just get out there and do it. It will change your life. PS there will be many comments on this post saying you can climb in both Ecuador and Nepal with local guides for a few hundred dollars … and that is true. Anyone can climb anywhere with less money, I’m not addressing that market segment. I did Cayambe and Cotopaxi just a week before. Maybe I’ll go back for Chimborazo someday! Experiencing altitude at 19k was a great lesson in mountaineering. The final run to the the summit of Cayambe looks like a fairy tale. Overall Ecuador was an amazing country to visit. They are all great climbs with “civilized” logistics ! Interesting! While you make a great case for Ecuador, I feel your comparison fails to adequately account for the incomparably breathtaking, immensely humbling and totally magic sense of wonderment one can only experience in the presence of the grandest array of big mountains on the planet. Certainly you remember the first time you topped the ridge entering Tengboche and…..there she was! At the same time, you didn’t compare the size of the crowds one is likely to encounter in each region which, depending upon the season, can definitely be a negative in Nepal. I’d be interested to hear how the crowds in Ecuador compare. I sure appreciate the great work you do to keep us informed of what’s happening in the mountains, and also your commitment to fighting alzheimer’s! PS: It seems to me that your picture of Mera Peak actually shows Cho Polu (22096ft).